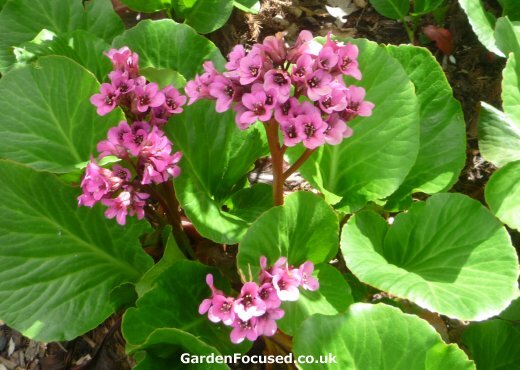 Is Bergenia Right for my Garden? 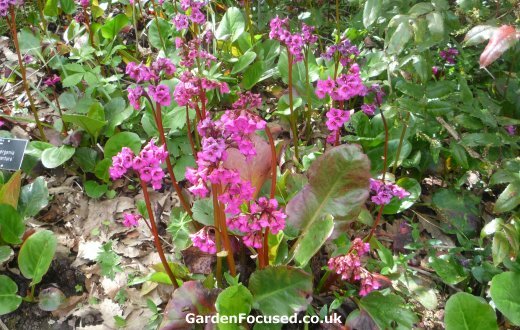 Bergenias (also known as Elephant's Ears or pigsqueak) are evergreen, ground cover perennials (live longer than two years) which normally grow to a height of 50cm / 18in high. They spread to around 1m / 3ft round after a couple of years. In spring most varieties produce pink or purple flowers although some are white. Extremely hardy, they tolerate shade and dry conditions very well. These are very tough plants! Bergenias are natives of Eastern Asia, parts of China, Mongolia and Russia in particular. These areas have extremes of cold in the winter followed by warmish summers. Bergenias have evolved to be able to cope with both. They grow to a maximum height of 60cm / 2ft and spread to 1m / 3ft or more depending on conditions. The green leaves are normally evergreen and during the colder months they often take on a definite pink hue. They make excellent ground cover and suppress almost all weeds. They grow best in partial shade and but tolerate full shade and full sun well. A well grained moist soil is probably the best environment but they are remarkably good at growing in dry conditions as well. Established plants require no attention other than an tidy up. They are hardy down to far lower temperatures than even the coldest parts of the UK will ever encounter, -20°C or lower is not a problem for Bergenias. They can be grown in containers but this not their ideal environment and does not frame them particularly well. 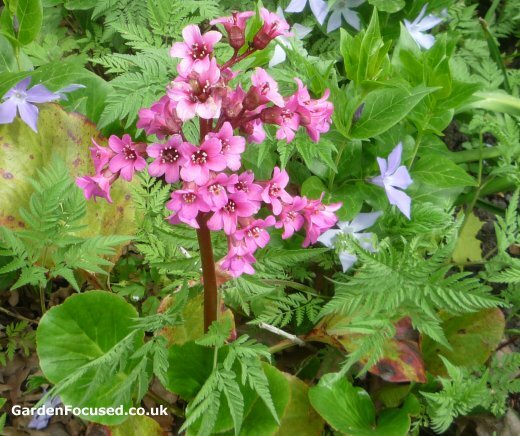 Many garden centres sell Bergenias especially from March to May when they are in flower. They are also commonly sold online. Crocus sell these plants online at a good price and they have a large choice of different varieties. 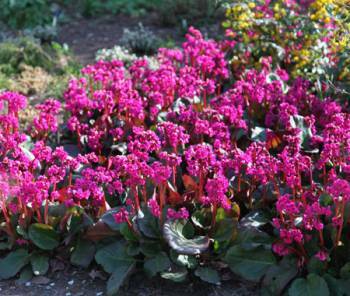 Click here to visit their page which currently has 22 different varieties of Bergenia. See lower down this article for a few varieties which we can recommend from personal experience but almost all varieties grow well in the UK so choice comes down to personal preferences. The National Collection of Bergenias in Cambridge is an excellent place to see Bergenias in a natural setting. See their website here for more details. This is a strong growing plant in good conditions. Allow for at least a 1m / 3ft spread when full sized. When established a Bergenia will look after itself. There is no need to feed them unless the ground is very low in nutrients. Neither is watering required except in severe drought. The tough nature of these shrubs is well understood by council landscape gardeners whose only care, if any, is an annual tidy up of dead and dying leaves. They do appreciate a mulch of well-rotted organic matter applied in late spring. Last year's used up potting compost is ideal. After four or five years the plants may well become congested and the solution is to dig them up, including the shallow roots. Split the root mass into three or four parts with a towel and replant separately. This is an excellent and fail-safe method of propagating bergenias. The varieties below are our own personal favourites. Medium sized, ice-white flowers in early to mid spring. As the flowers age they turn a very delicate shade of pink. The foliage is a dark dull green for most of the year turning a lovely shade of bronze and dark scarlet in winter. Has been given an Award of Garden Merit (AGM) from the Royal Horticultural Society. Bressingham Ruby is just as good although a different colour. Choose this variety if you want masses of white flowers in spring. Click here to buy this variety online now from our recommended supplier. Lovely dark pink flowers in spring but not as numerous as some other varieties. Grow this variety for its foliage which changes from green to bronze on the upper surface and dark reds on the underside. Not as common in garden centres or online nowadays but can still be found at Shoot Gardening. Also known as 'Silver Light'. Lots of spring flowers which are mainly white (slowly turning pink) but with dark pink sepals. The stems are dark red and attractive in their own right. In our opinion the green leaves are also one of the very best of the Bergenias, mid green and regularly formed. They turn red in late autumn to winter. This one of very best favourites and been given an Award of Garden Merit (AGM) from the Royal Horticultural Society. Click here to buy this variety online now from the GardenFocused recommended supplier. Below we list the key strengths and weaknesses of this perennial. QUESTION: I have had this plant for a few years this year the leaves have turned bright red does that mean I am going to lose it? ANSWER: Bergenia leaves do tend to turn red after they have flowered but this is a bit early in the season for that to happen. My guess is that the plant is under stress for some reason. Although bergenias stand drought well, the recent drought and high temperatures in many areas of the UK may well be the cause. If you suspect this applies to you I would water the plant well and then apply a mulch of organic matter (grass cuttings will do fine, well-rotted compost would be even better) and see how it goes. I'm sure that if normal conditions return next year your plant will be fine.